This Christmas I decided to make gig bags for my wife's and daughter's new instruments. My wife plays her shiny Christmas-present-opened-early baritone ukulele in the Diamond Harbour Ukulele Orchestra. She'd been practicing on a restrung guitar for a few weeks to learn the chords. Our daughter's christmas gift is an acoustic electric bass guitar so she can busk in Christchurch with her friends for some extra holiday cash. So, we've got two new instruments that are going to be carted around a lot and nobody likes to carry their instrument around in those cardboard boxes they come in! I made a gig bag for my acoustic electric bass a couple of years ago so I thought I'd document the process this time. I reckon if you are handy with the sewing machine and have the materials at hand, you could do it in a few hours. I did the first one (baritone ukulele) in an evening/morning (as you can see by the light in the pics) but I was making adjustments and taking lots of pics. The second one (acoustic electric bass) was all done in an afternoon. In fact, I think writing up this Instructable took longer! Please feel free to comment, ask questions, and if you like it, rate it. Liner fabric - needs to be soft and it can be stretchy. Zipper- needs to long enough to let the instrument slip through it when it is open (with a bit of extra room to be safe). We've renovated the house recently and ended up with a stack of roman blinds for windows that aren't there anymore. They are thick cotton with an insulation filler and what looks like ironing board reflective material. I used these for the liner fabric with the cotton facing the instrument because it was soft and padded. For the outside we had more of the thick cotton glued to the reflective material (they were roller blinds). It was good because it didn't stretch and was tough. THe zipper was from a bag of zippers my mother bought at a thrift store when she was visiting. For the bass bags, I liberated the zippers from a freebee messenger bags. You know the type that you get free with your "welcome pack" at conferences (and only use it while you are there). I promise there are at least a dozen at every thrift store. Step 2: Measure Up and Draw! It would probably be wise to read all of this page before you started drawing. 1. Lay your instrument on your inner fabric and draw around the body. It doesn't matter which piece of fabric as long as it isn't the outside face of the outer fabric. I chose the inner so I didn't end up with a gig bag with pencil marks on it. Try to keep the pencil as vertical as possible and don't point the pencil in or you might draw on your instrument. For the neck, and head (where the tuners are), measure the widest point and draw straight lines back to the body. You can see that I first drew a widened part for the head but because the opening is at the other end, the head has to go through the neck part so the whole thing needs to be sized for the head to fit through. Now you have a basic outline of your instrument. We'll call it the "instrument outline"
2. Now you need to add an allowance for the thickness of the instrument. 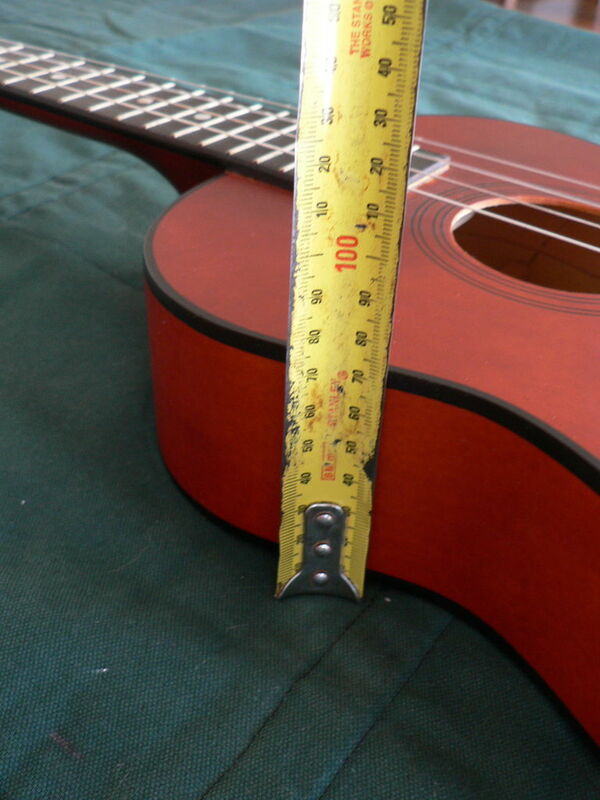 Measure the thickness of your instrument at the edge. I used a tape measure from the face of the instrument to the fabric. For the body, draw a line that distance out from the instrument outline. For the neck, draw a line 50mm (2") out from the basic outline. I found the easiest way to do this was to hold the end of the measuring tape on one part of the instrument outline and draw lines on either side of it at the thickness measure. Move around the instrument outline doing this and you'll end up with a dotted line that you can fill in. We'll call this expanded outline the "case outline"
By the end of this section, you'll have two liners and two outers in the shape of the Case Outline. If your shape is not symmetrical AND there is a front and back to the fabric you are using, make sure that the pairs of outers and liners "mirror" each other (front to front). Repeat until you have 2 liners and 2 outers. Now it's time to think about how you are going to carry the gig bag around. For the baritone uke, I put two rings so you could sling it over a shoulder. For the bass, I put rings for two straps so you could carry it like a backpack. The bass is long and unwieldy and I thought if you were carrying it through town or on busses it would be more stable on both shoulders. I put the rings on tabs and sewed through an outer and liner for strength but you could just sew them to the outer if it is strong enough. You could sew handles, loops and/or rings into the seam of the gig bag too. In terms of positioning, I just used a comfortable school-type backpack for measurements. The straps came from freebee messenger bags. You're going to make the case inside out so the seams are on the inside. 4. Bottom: Liner with instrument-touching side down. Center the zip across the bottom of the case. Mark the center on both fabric sides of the zip and on both liner pieces. Take the top liner-outer pair (1& 2) from the stack in step 5 and pin them together where the zip will go (between the marks you just made). Repeat for bottom outer-liner pair (3 & 4). Trim up the edges so they are even. put back in the stack like in step 5. Place the pieces in the order in Step 5 and start pinning them together. My layers were pretty thick and it took a lot of pins. Once pinned, trim the edges so no layer is sticking out past any of the other layers. Once trimmed, serge (or zig zag) around what you have just pinned and trimmed. Now you can slide your instrument into your "inside out" gig bag and see how it fits. Its a good time to see whether there will be any problems or adjustments required. This is when I realised that the widened head shape wasn't necessary and luckily I had left enough allowance that I could just trim the widened part and re-pin and serge it. If everything looks OK, you can sew what you just serged (not where the zip goes). My seam was about 8mm (1/3") inside the serging but cut it closer if you want it looser or vice versa. It will be a little tighter fit when it is turned "right side out" so don't trim too much now. A loose gig bag is more useful than one that is too small. Now you can turn the gig bag outside-out. If you are having a hard time getting the head to fully invert, you can stick a broom stick up gently persuade the corners to come out. If you are unhappy with the fit, you can always invert it and make adjustments. Some people are afraid of zippers, others are afraid of "sewing in" zippers. If you are terrified of zippers, you could use velcro or buttons or holes with shoe laces. Unfortunately for the zipperphobes, the zipper holds the weight of the instrument in this design. I can't guarantee how velcro would hold up if you started running for the bus with a heavy electric guitar in the gig bag. Your gig bag is still outside-out from step 8. Head to the ironing board and fold under and iron both sides of the opening. You should at the very least fold it under around 12mm (1/2") and you could do more to match the seams in Step 7. Match up the marks you made in the center of the zip with the center marks on the liner (you made these marks in step 5. You are going to sew through the outside, the folded under part, and the zipper. Pin one side, starting in the middle and work out to one side then the other. Make sure your center lines match up. Also, more pins will make the sewing easier. When you get to the ends, if the zip goes past the original mark, you can pick open the seam until it fits. Now flip it over and do the same on the other side. The other side is more difficult and you might need to pin the middle, then the ends, then the middle of each gap until you can fill it all in with pins. You can carefully move the zip closed to make sure it will be smooth and even. Don't worry if you have to re-pin part (or all). I had to re-pin one whole side and half the other side until I was happy with it. This is the most difficult part so if you are tired, stressed, rushed, or even pissed off don't try it. OK, feeling better? Good. So you are going to in a long rectangle around the zip. Sew down that side, across to the first side and to the middle. Take your time and make sure you are getting through the outside, the folded under part, and the zip. It's easy to stop, unpick and go again so keep checking where you have sewn regularly. Yours may come out perfectly, but mine needed some tidying up at the ends. Start by squeezing the seam past the zip until it looks tidy, then hand stitch the gap together with matching thread. You can go down and around the end of the zipper and/or over the top of it. Around is probably stronger but on top pulls them together better. Why not try a mix of both? This method saved steps in some places but added them in others. This one doesn't allow the pre-testing of the size and seam adjustments so you'd need to be a bit more confident about the shape. It also could be easier if your fabric is too thick to serge all four layers at once. 1) For the bass gig bag I serged each outer-liner pair all the way around. 3) When I sewed it, I started on one end of the zipper, sewed that side in and kept going on past the end of the zip all the way around the gig bag till I got back to the same point. I then flipped the case over and did the other side of the zip. 4) I ended up top stitching both sides of the zip (like in step 10) to keep the fabric from interfering with the zip but at least it was already sewn together so not nearly so tedious. 5) And I had to do more tidying up at the ends of the zip because I couldn't do the "sewing around the zip" in step 10. So if you any of these alternatives might be easier for you, go for it! Just in time as my ukulele bag is coming apart at the seams. it was really a mandolin bag but served the purpose. Been playing for 8 years now. Lov'in it. This is fantastic! Watch for it to be featured at Patternpile.com. Was there any problem with the zipper scuffing up the instrument. I'm guessing that since it's nylon, it wouldn't do that too badly, but just wondering. Also, have the nylon zippers held well? Thanks for doing this! I have some ideas for making my son a gig bag for Christmas, and this is helpful because it implements a lot of what I was thinking, and it seems to work. I haven't had any problems with the zips wearing out or scratching. Because the bag is sewn more like an envelope (2D) instead of a box, the zips are kept away from the instrument. A few years back I made a more fitted case using the zip and side panels from one of those freebie conference courier bags and even though it is a tighter fit, zips are doing fine and no scratching. Excellent instructable, I wanted to make a leather gigbag for my uke and keytar. I would favorite it but I keep getting an error. Thanks Cameronhirsch, I've worked with leather for making guitar straps ect... but if you want to sew thicker hide, you'll have to use a "walking foot" industrial machine or stitcher used for making shoes. When I made my double bass case a few years ago, I put hide between my inner and outer layers where I wanted extra protection. I kept it in place by sewing the inner and outer layers together around it (like quilting?). That was 15 years ago and the leather pieces are still in place and I didn't have to sew through the hide. Yeah, I've been a freelance tailor/seamster for 6 years now. It's amazing some of the stuff you can make with a little effort and some time. Thanks for instructions on making a guitar bag. I am going to try it. Like your re use of old curtains.. this is exactly what I will use with an old mattresss protector as lining. Good to see a bloke so handy with a sewing machine. well done. Thanks for the compliments. As my wife says, I'm a bloke and its a machine. Shouldn't be too surprising.... If you caught me hand sewing something.... that'd be a different story. Hey man sweet idea. Idk if id trust my les paul in it tho but it would be cool for taking an acoustic on a campout. Fair enough. I still carry my Fender Jazz Bass in a hard case but it's a pain on public transport! Wow nice work, I made a similar bag for my friend recently for her ukulele but mine was only a single layer of fabric and the zip I had was so long it took up a whole side of the case. Unfortunately, the ukulele I measured off (my brothers), was just a little bit smaller than hers-as it was a surprise present I couldn't exactly ask to look at hers-and hers didn't fit..She liked the thought though! Man, that's tragic. At least it wasn't a dress....too big or too small has disasterous consequences. Very cool! I was thinking just the other day that I needed a soft case for my electric guitar to carry it around more easily. Perhaps I will modify your instructions for a smaller guitar and give it a go. If I do build up the motivation to make a variation on this, I'll be sure to let you know (perhaps even post an Instructable or slide show). Anyhow, thanks for the inspiration! Hey Randofo, I love your instructables, especially the T-shirt floor. You can definitely use this instructable to make a guitar gig bag.